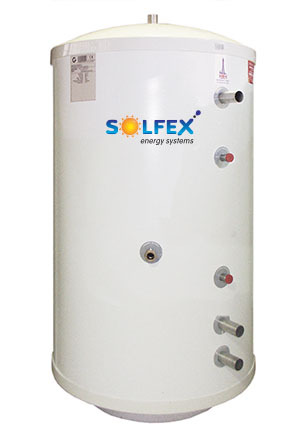 SOLFEX energy systems multi connection Buffer Tanks assist in remedying many heat pump installation issues. To increase the lifespan of key heat pump components, as well as to ensure that potential flow related issues are not applicable, SOLFEX Energy Systems in partnership with their UK based manufacturing partner are proud to offer a flexible solution to a multitude of installation types. Many heat pump manufacturers have a specific requirement for minimum water volume in order to increase the lifespan of the units compressor. In some cases, this can be far above what would normally be present in a heating system. In this instance, a SOLFEX buffer tank can provide the much needed dedicated system volume. As the name buffer suggests, these tanks are also extremely capable of storing energy for multiple uses. This energy may be required when the heat pump goes into defrost mode or even when it is serving domestic hot water. Every minute that a heat pump is serving domestic hot water is a minute that the heat pump is not providing central heating. A buffer tank can assist in tackling this problem.